Bal Foyen is a small region on the southern coast of the Inner Sea of Morrowind, east of Stonefalls. It was a wild expanse of marshland and volcanic landscape until the mid-Second Era and the formation of the Ebonheart Pact. 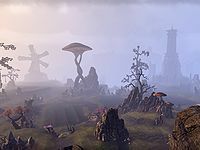 Much of it was turned over to the Dunmers' former Argonian slaves, who planted saltrice and herded guar in the former wastes. The Dunmer-built Fort Zeren is found in southern Bal Boyen, and the Argonians established the town of Dhalmora in the east. Cases of Corprus were reported in the region in 2E 581. In 2E 582, the Daggerfall Covenant invaded Bal Foyen as part of a large-scale invasion of Pact territory. The local defenders succeeded in driving off the invaders and warning the city of Davon's Watch to the west due to the arrival of refugees from Bleakrock Isle, who had been forced to flee their homes after the island was sacked by the Covenant. However, the Pact suffered heavy losses and civilian casualties during a simultaneous attack on both the dockyards and Fort Zeren, crippling the region.